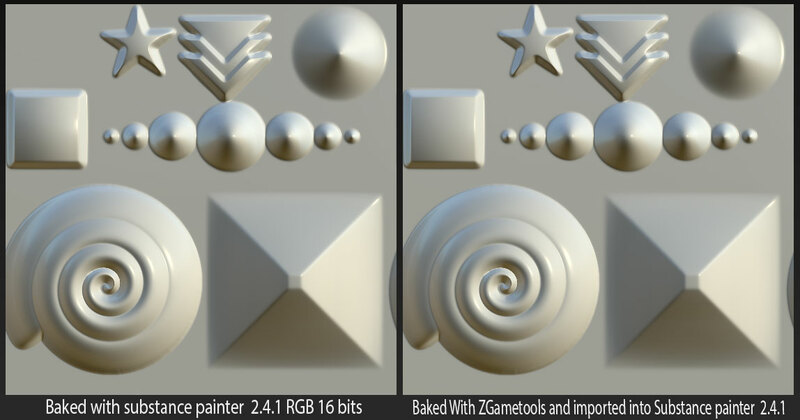 I had baked the normal map in RGB16F native format using the baker available in Substance Painter 2.4.1. I had imported the bakes done with zTexturer/Zbrush (PSD RGB 8bits) as resource in Substance Painter. At this moment, it seems hard to tell which texture as been baked with allegorithmic or zTexturer Normal mapping algorithm and which texture is best quality to work in Substance painter. I gonna apply a material that give some reflection ( glass visor) and let judge about the quality and difference in Substance painter viewport, with both Painting mode, and Iray mode. Conclusion : zTexturer baking in RGB 8bits show on Low dark contrast for the depth( blue channel) of the normal map, which result in some stepped gradient not really accurate. At the moment you export your normal map to a RGB 8bits format file even if you done the normal map in Painter, the low dark contrasts from the depth data in the normal map will let display that kind of artifacts in Marmot Toolbag, Unreal engine 4 and more. If you have to continue to work on the texture with substance painter it would be clever to bake the normal map using Allegorithmic bakers instead of zTexturer and using the tools available to create a substance painter project from Zbrush directly. And do not forget the most important is the final result you get with the game engine of your choice. Do not decide what is best solution without to have a look about what are the cons and the pros to use Allegorithmic or zTexturer algorithm with different game engines. Note : RGB 16bits format is too big to be use in game industry.